Get a free sample of YouBeauty Collagen Soft Chews. 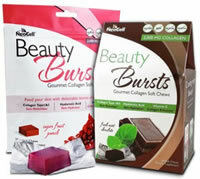 Enter you name and email address and get a free beauty bursts sample and a coupon. You also have a chance to be one of the lucky four who will receive a 6 month supply of Beauty Bursts. This is for the first 10,000 to submit their requests. Apparently they are still taking registrations for this sample, although it is possible that they will not announce when all 10,000 have been given away.